Order Amish and works at a pharmacy with no plans to be a traditional wife and mother. Joshua Smucker met Holly at a youth activity and for the first time is attracted to someone. When he ask her out she immediately stops going to the singings. Circumstances bring them together and a common goal keeps them connected. Can Joshua win her over a convince her that to envision a future together. I received a free copy from Cindy Woodsmalls Launch Team. No review, positive or otherwise, was required – all opinions are my own. Kathleen Fuller writes a variety of Amish stories and encompasses diversity in the Amish culture. Some of the districts are strict Old Order and some are more lenient. In this compilation of stories, An Amish Family, Kathleen gives us four narratives, each different and each equally compelling. Building Trust is how we often hold resentment and forgiveness, which is often undeserved, and it can destroy our other relationships. Grace’s Daed forbids her to be courted by Joel because of something he did as a youth. In A Heart Full of Love Chris and Ellie are expecting their first child, but Ellie was blinded in an accident and her Mamm is not convinced she is able to care for the child. Her Mamm’s interference cause’s resentment and misunderstanding, and Chris decides he has to step in. Emily and Reuben are Surprised by Love, when they enter into a plan to stop their parents from matchmaking and pushing them to find love. When Anne Marie’s Mamm decides to remarry and move to Ohio, in A Gift for Anne Marie, she must evaluate her friendship with Nathaniel. Nathaniel has to decide if he wants her to move or if there is more to their friendship. I received a free copy from Zondervan a division of Thomas Nelson Publishing Group. No review, positive or otherwise, was required – all opinions are my own. 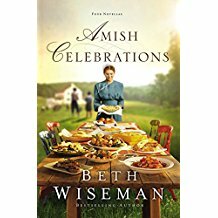 Beth Wiseman’s four novella’s AMISH CELBRATIONS illustrates the culture differences even in the Amish communities and the struggles we all face. A Gift of Sisters is how fraternal twins who love each other still struggle with jealousy and sibling rivalry. You ache for each of them as Hannah and Rachel struggle with being honest with themselves and each other. A New Beginning is how even when we love deeply we often fear being transparent and vulnerable with each other. How we also may be drawn someone other than our loved one and can become distracted. A Perfect Plan is how often a journey is fraught with obstacles so that we question if this is the right road. Priscilla and Chester must decide if love is enough and God will prevail. 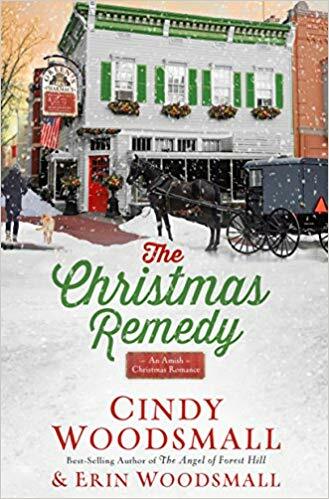 A Christmas Miracle is of an old order Amish couple opens their hearts and home to an Englischer couple as their daughter seeks help from Santa and his elf. Beth always gets to the heart of the situation and gives us much to think about. You are never disappointed in reading her works. 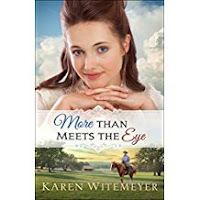 More Than Meets the Eye by Karen Witemeyer was off to a slow start but quickly became an engrossing story. Logan Fowler seeks what he convinces himself is justice for his dad’s gambling loss of the homestead of his family. He sets out to find the man who he’s convinced cheated but instead finds a family made up of orphans who made a home. Evangeline Hamilton has a pair of mismatched eyes that locals consider a curse. In spite of he judgement of the community she is an optimistic joyful woman who loves her misfit family consisting of Zach and Seth. Logan quickly becomes perplexed with Evangeline’s sunshiny personality and finds himself falling for her. Can he give up his quest to reclaim what he believes is rightfully his? Can Evangeline forgive his deception and desire for vengeance against her brother? I received a free copy from Bethany House a division of Baker Publishing Group. No review, positive or otherwise, was required – all opinions are my own.